A Color Guard marches in downtown Gilroy Veterans Day. 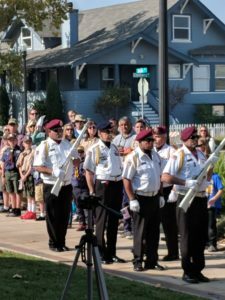 The Gilroy Exchange Club, Scouts and members of the Veterans of Foreign War in South Valley honored those who have served in the Army, Air Force, Navy, Marines or Coast Guard at the VFW Post on Sixth Street in downtown Gilroy. It was an emotionally moving event with a Color Guard and speeches about the importance of honoring these men and women who answered the call to duty. In Morgan Hill, a group of about 100 residents came together at the downtown Veterans Memorial to pay tribute to the local men and women who served in the military. Among them was Carol Agaliotis, who pointed at the name of her uncle Charles Raney on a brass plaque engraved with the names of South Valley residents who died in service since World War I. Raney died at 22 after his plane was shot down in the South China Sea during World War II. The premonition proved sadly true. A military service chaplain came to her house four days later and told her that Raney had died at that time. Let us remember not just on Veterans Day but every day that America is home to more than 325 million people who enjoy the blessings of freedom paid for by the ultimate sacrifice made by men like Charles Raney. Freedom isn’t free. 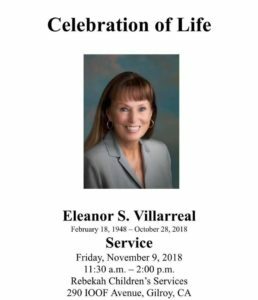 Beloved Gilroy volunteer Eleanor Villarreal was given a fond farewell by about 250 people Nov. 9 at a celebration of life on the grounds of Rebekah Children’s Services. Gilroy Life Publisher Marty Cheek attended and was impressed by the life Eleanor led and how many people it impacted. 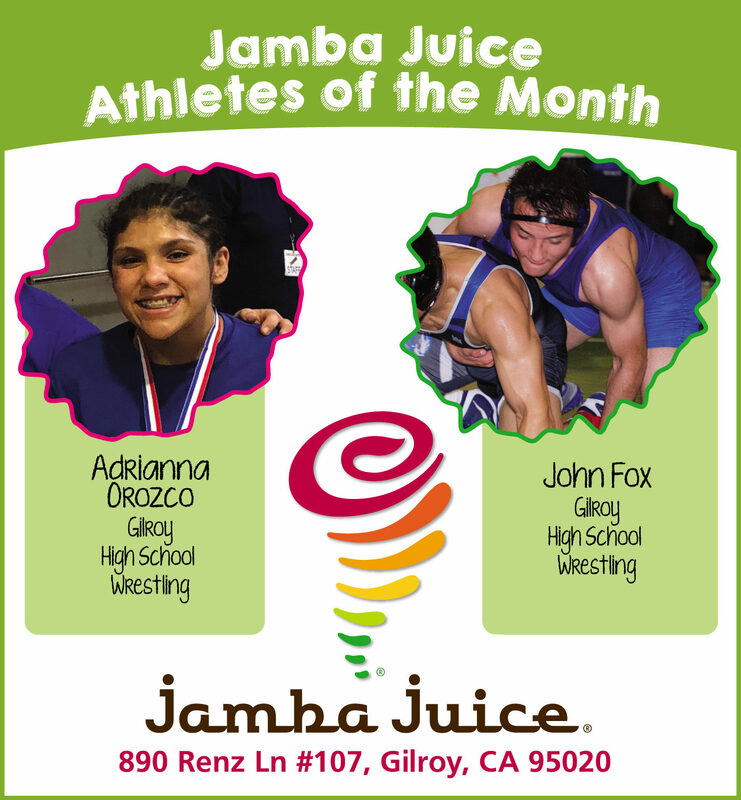 She served on many boards and participated in various community events including the Exchange Club of Gilroy and the Coastal Habitat Education and Environmental Restoration group. 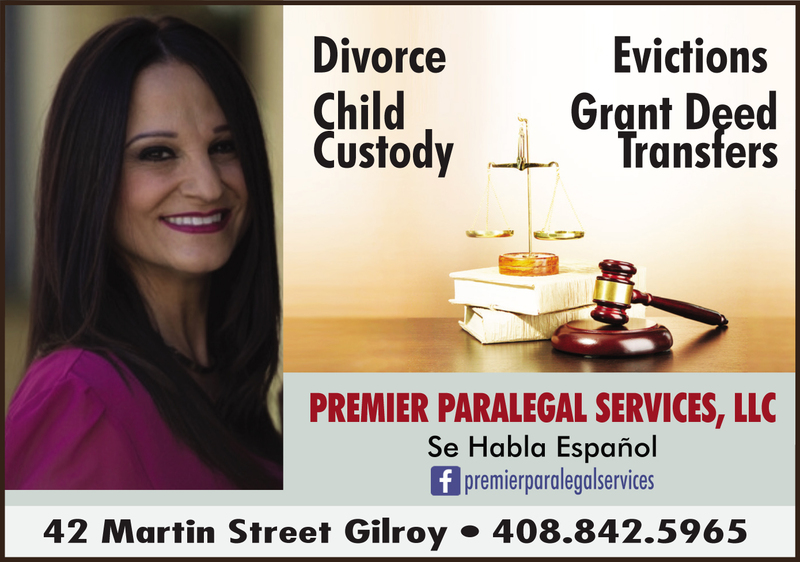 She help found the Gilroy Hispanic Chamber of Commerce, the Gilroy Hispanic Cultural Festival and the Latino Family Fund. She was probably best known for her devotion to children while working at Rebekah Children’s Services and representing the South Valley on the First 5 Commission of Santa Clara County. The people who lost their lives and their homes in this month’s devastating Camp Fire in Butte County are in the thoughts and prayers of local residents — including Britton Middle School seventh-grader Ella Francis. We received a beautiful poem honoring them from her grandparents, Christine and Ralph Chellino and her parents Mike and Teressa Francis. “After dinner (one recent evening) my 12-year-old granddaughter, Ella Francis, composed this empathetic poem reflecting on the pain caused by the California fires, in particular the Camp Fire,” Ralph wrote us. 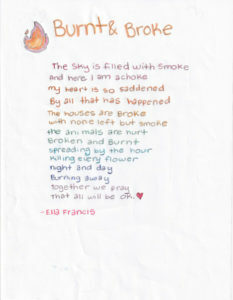 Above, read the poem sent to us by Ella’s proud grandpa and grandma. We share the sentiment of these words and encourage all Gilroy, Morgan Hill and San Martin residents to help out the victims of this tragedy in any way you can.